There are three video game featuring Space Marine's that I really think could be classified as “Famous”. Master Chief from HALO, Space Marines from StarCraft, and the granddaddy of them all, the man simply known as “DOOM Guy”. Originally released in 1993, DOOM has been the template for First Person Shooters (FPS) ever since. DOOM Guy has also been the standard template for Space Marines in video games. Non-talkative, deadly, always angry, and has no time for explanations. DOOM has always been close to my heart as it was one of those games, I still continue to load into and play the original two. So when I was told there would be no early press reviews I was very scared that this game was not up to the task of fulfilling that nostalgic hole in my heart. This was only reinforced by the less than stellar multiplayer beta weeks before its official release. Though DOOM has and always will be a single player in my mind. The lack of early reviews forces me to quickly play through and not enjoy everything the game has to offer, and then make a review. This is not ideal for reviewers and critics. Before we jump into the game, I want to reflect on something that game developers just simply skip over or make you go into a .ini and change to get what you want. That is the settings page, these options are just glorious. Native support for 21:9 is a huge bonus, but it gets better. Many games have v-sync on/off, DOOM offers V-sync on/off/adaptive so those of you running Nvidia’s G-Sync or AMD’s Free-Sync can easily use this option now instead of hoping that turning off v-sync is enough. They also show that they want to remain neutral in the hardware wars by simply calling it adaptive. There are so many options and the rank from Low, Medium, High, Ultra, and Nightmare. I am currently using my wife's computer, as I tore my computer apart to find a water leak, which has a i7 4790k and a GTX 980. I actually got an error saying that I couldn’t change a setting because it doesn’t have 5gb of VRAM, and that prevented me from doing so to prevent crashes. There is just so many options in the settings. There are 5 difficulty settings, and normally I do reviews on medium difficulty and have a easy time doing so and taking screenshots. This game gave me trouble trying to stay alive and take a screenshot in the middle of action. Those that think games are getting too easy will be pleased on the difficulty I believe. Though I have not played at Ultra-Nightmare setting yet so I’m not sure what to expect on that difficulty. DOOM starts off right with DOOM Guy waking up looking at a rune, and you can already tell he is angry. While other FPS games will start with 5 minutes of exposition of what happened, you start with a pistol and a kill count of 4 Possessed Ones within the first 15 seconds. This instantly felt right, no backstory, no dialogue on the history of DOOM. You simply start enraged that hell is back, and start cracking skulls. I already had those warm fuzzies about this game. This strongly reminds me of the first games where literally you start in a unknown place and just start shooting baddies. The pistol was surprisingly weak and made me worried that they were trying to make it difficult by simply lower stats of your character and guns. This is not the case, only the starting pistol has infinite ammo and you get an instant upgrade in the form of a shotgun within the first 5 minutes of the game. That isn’t to say there isn’t a storyline, there is. Usually it is done in very short time, to keep you in the mindset of crush and smash, there are instances of random holograms saying 3-4 sentences and then moving on. It gets the job done but it’s short, simple and to the point like any DOOM game should be. The story is light and the action is deep… in blood. The graphics are outstanding, just look at the rock where behind the helmet, the runes are carved in but faded, the gloves have different textures between the wires, leather, metal and plastic pieces. Enemies are well designed and unique, they have a firm presence that they are from hell. These aren’t even the highest level of graphics, I can’t wait to see DOOM on my fixed computer. Taking a look outside gives me chills out how the environment looks, constant wind moving the red sands and seeing research centers in the distance. The cliffs give a sense of danger at the ragged edges sticking out. These are some of the best graphics I’ve played in some time. Another concern is that DOOM would censor a lot of the more bloody and gruesome aspects out of the game as the game's history has been a source of controversy. I am glad to report that this is not the case. The above picture is a once clean room after a single fight. Causing this much mayhem is an art form, and to make that much blood is a skill no one should have. The guts and gore are plenty and overfilling. The animations during melee are very fast and were well implemented. Glory Kills to a demon when they are flashing after some damage reward you with health packs, thus allowing you to continually heals as you destroy the enemies in your path. The secrets are no longer little tiny differences in wall details but levers and more puzzles that lead to anything from a unique weapon and armor upgrades to passage to the old style game that can be played later on from the main menu. This gives a unique twist on the secrets and Easter eggs, as before it was just a gun a level earlier or extra ammo/health packs. These secrets are well hidden and sometimes require to backtrack to find them, due to you doing something like turning on the power which opens a door. I can see people losing their minds finding all the secrets. DOOM brings back my childhood in a morbid way. The gameplay is not just a scare game, or a boring FPS but a blend of both filled with lots and lots of violence. I highly recommend that anyone that played the old DOOMS or feel their mature enough to play this game to pick it up when it comes into your price range. It is a game if you buy you will not regret and are bound to have many many hours of fun hunting down secrets and punching demons in the head. I wouldn’t change a thing, the game feels right, it plays right, and it looks right. I always nitpick at things on all the games I play. Fallout 4 had aging graphics and awful graphic settings, ARK:Survival Evolved had repetitive game play. This has so many graphic settings it’s sure to bring a smile to your face, the graphics are awesome, and the gameplay is just a ton violence fun. This is easily a game of the year candidate already. EVGA @ LanDiego State 5 - Event Recap! This past weekend, EVGA had the opportunity to attend LanDiego State 5! An awesome event that took place on the San Diego State University campus. This was our second year as a sponsor for the and we had a blast along with all those who attended! We were showing off some EVGA hardware in two different systems that were on display at the booth along with some EVGA swag in the form of T-shirts and lanyards! Thank you to all those who stopped by the booth and chatted with us. We event had a chance to stream the event and get in some Killing Floor 2 gameplay via our TeamEVGA Twitch channel. Check out the event stream here and watch as the our booth gets overtaken when Jesse, the event MC announced EVGA was in the house! EVGA along with some other great sponsors donated a ton of prizes for the event raffle. From motherboards, to gaming mice and power supplies and even a shiny new EVGA GTX 960 SSC graphics card! Check out the lucky winners pictures down below! LanDiego State 5 was a success for both EVGA and the LanDiego crew. Again we would like to thank them for inviting us to be a part of their event and thanks to all those who came by the EVGA booth! Check out some of the event images and EVGA raffle prize winners down below! LanDiego State 5 is upon us! EVGA is proud once again to sponsor another local Southern California LAN event taking place at San Diego State University this weekend! LanDiego will be hosting tournaments for Rocket League, League of Legends, Smash Bros Melee, Smash Bros 4, and Street Fighter V! Along with the awesome tournaments where participants will be able to win prizes, there will be some great prizes being raffled off at the event. Among the prizes will be some awesome EVGA products that we have donated for the raffle! We will also have some awesome EVGA Swag to give away to all those who visit our booth! So we encourage everyone to come on by and say hello! LanDiego State 5 will kick off on April 30th from 10am at Conrad Prebys Aztec Student Union in Montezuma Hall at San Diego State University. Lets get ready for a LAN party! EVGA @ BeachCon 2016 - Recap! Today EVGA had the opportunity to attend BeachCon 2016, the annual premier gaming event for students of Cal State Long Beach and the Long Beach community. We had the pleasure of continuing to be one of the main sponsors of the event along with some other great companies that donated their time to a great local event. EVGA once again came through with lots of swag in the form of T-shirts, and lanyards for all those who visited our booth. We donated some goodies to the raffle that everyone got a chance to enter after purchasing a raffle ticket, and sponsored the CS:GO tournament along with prizes for the 1st, 2nd, and 3rd place winners! All in all BeachCon 2016 was a great success for both EVGA and the BeachCon and CSULB eSports teams! Check out some of the awesome images captured by our very own EVGA_JamesL who donated his time to come by and photograph the event for us! A big thank you to all those who visited our booth, asked us questions and those who won all the great EVGA products! Our last photo is a great one with one of our fans wearing one of the EVGA classic T-shirts and getting a new 2016 T-shirt, I'd call that an upgrade!! See you next year at BeachCon 2017!!! Its that time of year again where the EVGAGaming team gets to venture out of the office and interact with the local community. BeachCon 2016, the annual premier gaming event for students of Cal State Long Beach and the Long Beach community. The event will be held at the CSULB's Walter Pyramid on April 23th, 2016. Featuring a rock solid LAN setup, console gaming, tournaments and best of all prizes and free stuff! The event will take place from 2PM until 2AM! The BYOC event will feature a number of tournaments to choose from including CS:GO, Super Smash Bros., League of Legends, Street Fighter V, Hearthstone, and Heroes of the Storm. EVGA is once again proud to be one of the many sponsors for the event. We will have a booth at the event, so if you plan on attending, come by and say hello!. We always enjoy seeing fans of EVGA and fans of gaming in general from our local communities. The following review was written by our good friend SaltLake. He is also the author of the "My Diary of Life on Ark" series and Fallout 4 Review. We would like to thank him for taking the time to test his own monitor and provide us with his review. Enjoy! Last year my monitor was starting to die, I had the monitor for 6 years it had given me its money's worth and then some. I was deciding between 2 screens or 3 screens. 2 screens meant my crosshairs would be right between them, and I would be looking dead center of the bezel of both monitors. 3 monitors meant that my whole desk would be nothing but monitors, which left no room to do anything else like studying or painting. I love gaming and want to experience a wider field of view, but I didn’t want to make sacrifice all of my desk space or looking at an ugly bezel. The only option was 21:9 in either 2560x1080 or 3440x1440, but these too have issues. 2560x1080 on a 34” monitor meant low pixel-per-inch that was noticeable, and 3440x1440 normally only runs 60 hz and neither runs G-sync. If I was going to buy a monitor I wanted to buy a premium monitor, after all my last monitor lasted 6 years. I could only wait patiently for a company to answer my plea. In October 2015 Acer released their Acer Predator X34 monitor, 3440x1440, 100 hz overclocked, slim bezel, IPS, and many other features such as a light bar, solid steel stand, and curved, it seemed to be a perfect monitor. Many reviewers gave it high remarks such as Linus Tech Tips, Pauls Hardware, JayZ2Cents to name a few. Though users were reporting issues overclocking to 100hz, bad backlight bleed, and even some color discoloration. The Acer X34 was unavailable shortly afterwards and even had a recall. It was re-released in December and I purchased it right away, spending that 1300 USD was painful and I took a gamble as they said they fixed all of the issues. A gamble that I will say was worth it. At the time of this review my DSLR camera is still “shipping” from repairs, so you are going to be stuck with the stock photos and some crappier shots. The stand is the number one reason why I would not have bought a Acer monitor before their XB280HK and XB270HU were from my experience, very wobbly. The new stainless steel stand is exceptional! I actually think this might be my favorite feature. It has a metal loop painted red, that stand out from the gunmetal stand that can be used for cable management. The stand mounts via a 100mmx100mm VESA mount that can be removed, which is a benefit for those who want to mount multiple or movable monitors. Does it get rid of all the wobble and movement? To be honest no it doesn't, the monitor is simply too big to do that. It does a better job at wobble management than most of the smaller sized monitors stands do. I just can’t help tapping the stand and enjoying that feeling of solid steel on my desk, it gives me peace of mind that my monitor isn’t going to fall over or wobble during gameplay. Underglow lighting I always thought was a gimmick, and to most it is. I will say it is nice to have the underglow while gaming in the dark. I normally keep a pen and paper on my desk for taking notes and ideas that I think about or discuss with people over Ventrilo. The underglow is nice during those times and there is no need to write in the dark, or turn on a light. I simply keep my pen under the monitor and can easily see. I will say I wish there was a way to either have it auto-turn off when I don’t need it, and turn on when it gets dark or turn the light off. This feature would require a higher price, which the x34 already pushes the price high enough. For convenience there are 2x 7 watt speakers, which are decent but nothing special. Anyone who drops 1300 US dollars on a monitor is probably going to buy for a pair of headphones or standalone speakers. It is still a nice feature for those who use headphones and want to show friends or family something that requires sound. The screen is obviously the main feature of any monitor. IPS, curved, g-sync, 3440x1440 and 100hz are the X34’s specific features. All of these features on their own make for a decent monitor but not great monitor. There are better ones out there with one or two of these features alone. It is when you combine them all that you get a fantastic monitor. 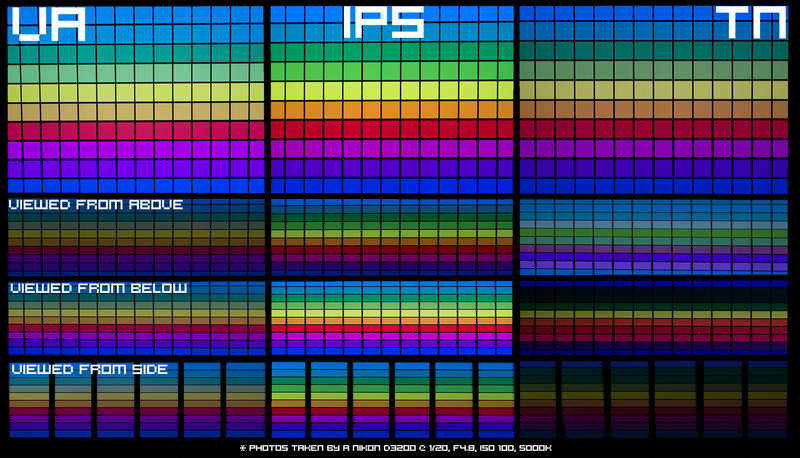 IPS gives you very true colors and it has a matte finish so there is no reflection taking away from it. IPS normally deals with higher latency but Acer managed to get down to 4ms which I think a majority of people will not notice. If you aren’t a competition shooter you probably aren’t going to notice it. I would trade 3ms difference for the huge benefit of color. As reddit user /u/RampageIV’s picture shows you the difference between VA/IPS/TN panels and at different angles. Additionally it has two notable features; the Gsync (which can be read about here and the curved screen which is the topic of endless debate. Gsync lends itself very well to the Acer X34 because of its weakness at 100hz. It also creates dips in FPS, and what would be noticeable tearing, is rendered obsolete. I have hard time telling what my frame rate is because it really does make playing games much more pleasant and enjoyable. As for curved screens.. I am not a big fan of curved screen TVs, but I do find it that my eyes seems to drift back to center and focus my attention on the X34. If you don’t know or haven’t experienced curved screens, I recommend you look at a curved monitor (not a TV) and to see if it is for you. It is a debatable issue with some saying it’s a game changer other saying it's a gimmick. I like it but it’s barely noticeable. The 3440x1440, 100hz, curved and Gsync combination is unique and, as I already said, it works perfectly. Even though 3440x1440 resolution isn’t the most widely accept resolution for computers. It is gaining support more from developers as more people look into ultra-wide monitors. It comes at a cost, most 3440x1440 normally runs at 60hz, Acer x34 also runs at 60hz but can “overclock” to 100hz. Naysayers will say 144 hz or nothing, but the difference between 60hz or even 75hz to 100hz is more noticeable than 100hz to 144hz. I had no issues with overclocking to 100hz and as others have pointed out, why doesn’t it ship at 100hz? It is guaranteed to run at 100hz, so simply ship it at 100hz. Even though Fallout 4 .ini file can be changed to run 21:9, things like the power armor HUD is still 16:9. Not everything about this monitor is joyous and perfect, as it has its flaws. The first is the control and menu system. I dread using the monitor's menu, it has good options but navigating and knowing if your settings are saved or not is frustrating. I set it up and have left it alone, but I wish I could change settings or at least know if my gaming profiles were saved and change them as I need. The light bar which is okay doesn’t have full RGB settings so people that use abnormal colors, like my wife's aqua blue theme, doesn’t match. There is backlight bleed but no worse than the Samsung curved TV in my living room, or the Samsung and LG curved monitors at the mall. Located on the back are 4 USB 3.0 ports and headphone ports which aren’t that ergonomic at all and actually are rather a pain to access. The headphone port for example is in the center. So you have to either wrap your cable around your keyboard and mouse, or you can go over your keyboard and have your fingers hit the cable. Neither of these options are the most optimal and its best just to go straight to your pc. The biggest complaint for people is the price, and it's a fair complaint as 1300 US dollars is not cheap. Acer added every feature they could and to be honest I don’t see how they could make it much cheaper. It's a complaint but I find it hard to really make it any cheaper with all of its options. My final complaint is the monitor's power supply is external and lies on the floor. This isn’t new but I wish in this day and age that a monitor company would have the common sense to at least provide a space to hang it onto the stand. The X34 has a large empty space on the rear of the stand that is unused, which is an ideal place to have the power supply. I ended up using some strong double sided tape to hold it there and keep the cables semi neat. Full Resolution of picture can be found here. So after testing it for 2 months what do I think? I love it. There are flaws and complaints; there are annoyances at times when dev’s don’t support the resolution. This is my first time with an ultra-wide, and to be frank… I don’t think I can go back to 16:9. I know there are rumors of 3840x2160@144hz by the end of 2016. For me though… I will wait until 5120x2160, ultra-wide is just that good. I really wish this monitor was priced so everyone could purchase it and get feel as to what an ultra-wide monitors is like. I want PC players demanding to make 21:9 the standard for games. Acer released something with all the features anyone could ask. They made a bang with their return to the high-end gaming monitor arena, not with a small bang of a firecracker, but the tremendous blast of ignited c4. The Acer x34 isn’t perfect and it has room to improve… but what is perfect these days. For now the X34 is my piece of heaven and I will enjoy it. Did I mention how much I like the metal stand? The question is does the Acer X34’s little brother the Z35 or its cousins the XB271HK and XB271HU stand up to the same standard? I hope so, and my wife is itching to get one and hoping it matches her setup color, but for now I am still nursing my bank account from the X34. Stay tuned and maybe I will have saved enough money to do another review.